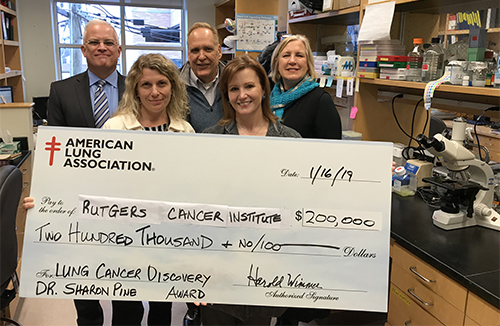 New Brunswick, N.J. – Rutgers Cancer Institute of New Jersey researcher Sharon R. Pine, PhD, has received a $200,000 Lung Cancer Discovery Award from the American Lung Association to examine potential new treatment options for patients with a sub-type of non-small cell lung cancer. Lung cancer remains the leading cause of cancer death for both men and women in the United States and non-small cell lung cancer accounts for 86 percent of these cases, according to National Cancer Institute Surveillance, Epidemiology, and End Results Program data. Squamous cell carcinoma is a type of non-small cell lung cancer. Most patients with lung cancer are diagnosed after the cancer has already spread and options for therapy are very few. There are still no targeted therapies available for most patients with lung squamous cell carcinoma. In this project funded by the American Lung Association, Dr. Pine aims to test a novel way to treat squamous cell carcinomas that have a mutation in the gene known as PIK3CA. A mutation in PIK3CA is believed to be the "driver" of this type of non-small cell lung cancer tumor. Pine and colleagues will conduct pre-clinical pilot studies to examine potential new treatment options for patients whose cancer has this mutation. “Precision medicine is fundamentally about providing a complete characterization of cancer subtypes at the molecular level and matching them with the most efficient and least toxic drugs, in order to improve survival for our patients,” notes Pine, who is also an associate professor of pharmacology and medicine at Rutgers Robert Wood Johnson Medical School. The project period runs through December 2020. The American Lung Association in New Jersey is the leading organization working to save lives by improving lung health and preventing lung disease, through research, education and advocacy. The work of the American Lung Association in New Jersey is focused on four strategic imperatives: to defeat lung cancer; to improve the air we breathe; to reduce the burden of lung disease on individuals and their families; and to eliminate tobacco use and tobacco-related diseases. For more information about the American Lung Association in New Jersey, a holder of the Better Business Bureau Wise Giving Guide Seal, or to support the work it does, call 1-800-LUNGUSA (1-800-586-4872) or visit: Lung.org. LUNG FORCE is a new national movement led by the American Lung Association to unite women against lung cancer, the #1 cancer killer of women. LUNG FORCE has three priorities: 1) Make lung cancer a cause that people care about – and act on; 2) Educate and empower patients and healthcare providers and 3) Raise critical funds for lung cancer research. The American Lung Association's LUNG FORCE is nationally presented by CVS Health. Find out more at LUNGFORCE.org.